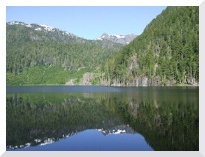 Arrowsmith Dam is located approximately 35 km south of Parksville. 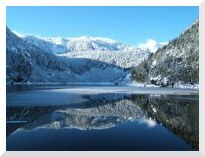 It was commissioned in 2000 and built as the Arrowsmith Water Service joint venture between the City of Parksville, the Regional District of Nanaimo and the Town of Qualicum Beach. To date, only the City of Parksville and the Regional District’s Nanoose Peninsula receive water from the dam. The Arrowsmith Dam, with a live storage volume of 9 million cubic meters, is used to regulate the flow in the Englishman River for release during the summer and fall to meet the domestic water demands in the service area. 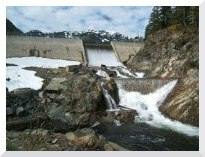 About half of the live storage volume behind Arrowsmith Dam is provided for release of water during low natural river flows, to improve fisheries flow in the downstream reach of the Englishman River. Flows are released based on a Provisional Operating Rule from the Ministry of Environment and Fisheries and Oceans. A minimum flow of 1.6 m3/s is required at the Island Highway/Orange Bridge coming into Parksville. Water is extracted from the Englishman River via an infiltration gallery operated by the City of Parksville.